In fact, I’ve had to “entertain” so many of these ideas that I’ve established a line in the sand: I will not wear women’s clothing. 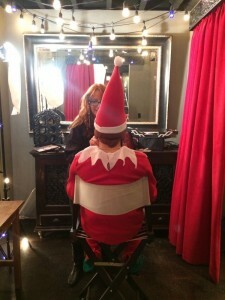 So this year, knowing my line in the sand, my team made a decision: I would dress as an elf. Well, it’s not women’s clothing. At least they got that right. So as I stood there in Jeff Dow’s studio, pointy hat and shoes on, rosy cheeks painted on by the talented Gaynel Wadsworth, I got to thinking: There’s a reason I’m doing this. And there’s even a bigger-picture lesson to impart here: There’s a reason we should all be entertaining the crazy ideas. Sure, I was standing there dressed like an elf — but as my team assured me, the costume actually aligned with our business goals and philosophies. Bottom line for me is that I know my team has my back. If they’re making me look ridiculous, it’s for good reason. Creativity is inspiring; teamwork is vital to the process; and brainstorming often begets really incredible ideas. I’m certain me dressed as an elf won’t win us any shiny awards, but that’s ok; the team process was inspiring to watch, it created wonderful conversations and it solidified a sense of trust — for them and for me. And I expect we might earn some glances (some sideward, but that’s ok) from social media onlookers. But at least they’re onlookers. Sometimes the crazy ideas play up important aspects of your business. For this example, my team (namely, Photoshop Wizard Brian Razska) was ready to place me in some of the coolest, most iconic locales around town. This would allow us to emphasize how incredibly cool our area is. And we take every chance we get to shout from the rooftops how grateful we are to live in and work from Reno, Nevada. I appreciated the value of this connection — making it far easier to don the pointy shoes. Crazy ideas can still underscore your brand values. One of our brand values is fun — mission accomplished — but another for us relates to our agency’s virtual model. By placing me, the elf, in locations around town, our copywriting team has the chance to meld the concept of the elf’s location with our team’s ability to be anywhere, any time, working on behalf of our clients. Win-win. Because people love fun, and they also tend to enjoy humor. Sometimes I recognize the humor is at my expense — and I’m ok with it. Especially when it comes to social media, personality and voice are critical. This contest concept would definitely communicate both concepts, loud and clear. Because the company owner should do anything that any of his/her employees would do. So I took a poll: Would Jackie Shelton wear the costume? Of course. Would Bruce Ruff? Sure. Would Nicole Dion? If coerced. Would Paige Galeoto? Well, three out of four is still a majority. In my mind, these five reasons were reasons enough. And I would do it again if I felt it served our needs, our philosophies and our business goals. So what crazy ideas have you entertained (or even done) for your business? Let us know in the comments. And if you haven’t done so already, join us on Facebook, like our page and check out some of my team’s creative handiwork. At least they didn’t make me wear tights. Edward Estipona (a.k.a. Ed The Elf) is president and CEO of Estipona Group (estiponagroup.com), a Reno-based virtual advertising agency with clients throughout the United States.